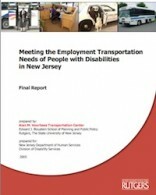 This study involved national literature and best practice research, spatial analysis, and consumer survey work to support the development of a five-year action plan for the NJ Division of Disability Services to address transportation barriers to work for individuals with disabilities working in or desiring to work in the competitive workplace. A report, Meeting the Employment Transportation Needs of People with Disabilities in New Jersey, is the result of this effort. (Client: NJ Department of Human Services, Division of Disability Services). 2005.